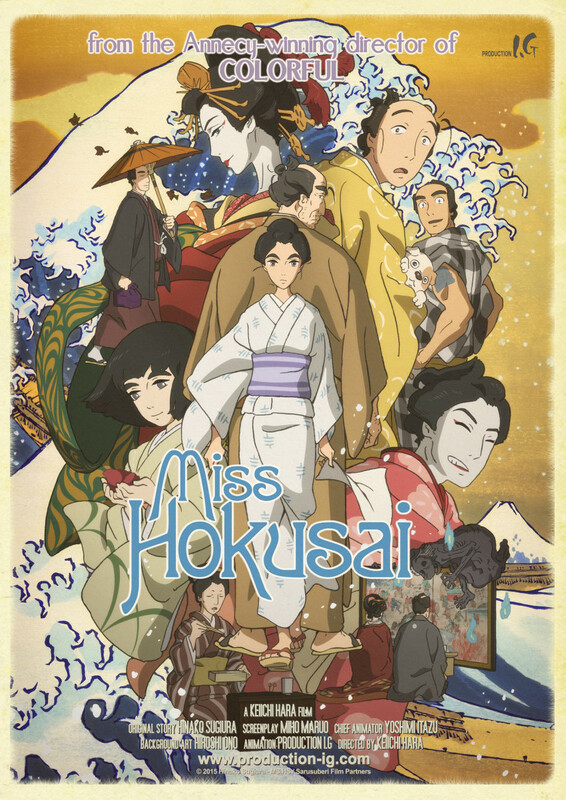 Glasgow, UK February 26, 2015 – Anime Limited are thrilled to announce the release of Miss Hokusai in the UK and Ireland. Hailing from Production I.G (Ghost in the Shell; Giovanni’s Island) and directed by Annecy winner Keiichi Hara, Miss Hokusai lands on UK and Irish shores later this year with a theatrical, with a subsequent home video release (both blu-ray and DVD). Based on the original comic book Sarusuberi by Hinako Sugiura, Miss Hokusai will be released theatrically in Japan from May 9th. UK and Irish audiences can expect to see it hit the big screen from October into November, 2015 with the home video date to be set in due course. The place: Edo, now known as Tokyo. A much accomplished artist of his time and now in his mid-fifties, Tetsuzo can boast clients from all over Japan, and tirelessly works in the garbage-loaded chaos of his house-atelier. He spends his days creating astounding pieces of art, from a giant-size Bodhidharma portrayed on a 180 square meter-wide sheet of paper, to a pair of sparrows painted on a tiny rice grain. Short-tempered, utterly sarcastic, with no passion for sake or money, he would charge a fortune for any job he is not willing to undertake. Decades later, Europe was going to discover the immense talent of Tetsuzo. He was to become best known by one of his many names: Katsushika Hokusai. He would mesmerize Renoir and van Gogh, Monet and Klimt, Edmond de Goncourt and Debussy. However, very few today are even aware of the woman who assisted him all her life, and greatly contributed to his art while remaining uncredited. This is the untold story of O-Ei, Master Hokusai’s daughter: a lively portrayal of a free-spirited woman overshadowed by her larger-than-life father, unfolding through the changing seasons. Andrew Partridge, President of Anime Limited says: “I’m thrilled to be able to bring this beautiful film to the UK. It’s a wonderful story with an interesting historical setting that is both enjoyable and fascinating. I’m really looking forward to giving this film a great release”. 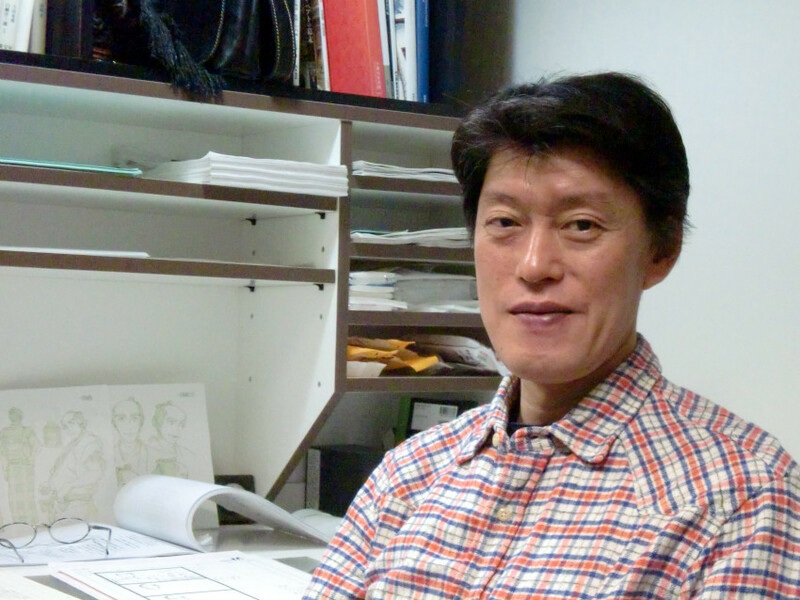 Keiichi Hara (born 1959) worked extensively on popular family and children animated shows, such as Doraemon and Crayon Shin-chan. His 2002 Shin-chan movie, entitled Crayon Shin-chan: Brilliant! The Great Battle of the Warring States (2002) was commended by Japan’s Agency for Cultural Affairs. International recognition came with Japan Academy Prize-winning Summer Days with Coo (2007) and especially with Colorful (2010), which was greeted with the Jury’s Special Distinction and the Audience Award at Annecy 2011. Both movies received theatrical distribution in France and other countries. Hara admires classic Japanese filmmakers such as Yasujiro Ozu and Keisuke Kinoshita. To the latter, he dedicated his first live-action movie in 2013, Dawn of a Filmmaker: The Keisuke Kinoshita Story. Hinako Sugiura (1958-2005) was a manga artist and researcher in the lifestyles and customs of Japan’s Edo period. Her distinctive style and unique storytelling made her win the Japan Cartoonists Association Award for Gasso (Joint Burial, 1984) and the Bungei Shunju Manga Award for Furyu Edo Suzume (A Refined Edo Sparrow, 1988). She also wrote numerous essays, and frequently appeared in the media as an expert on the period. Her manga, Sarusuberi on which the film Miss Hokusai is based, was published between 1983 and 1987, and gained cult status since then for the vivid portrayal of Hokusai’s daughter.